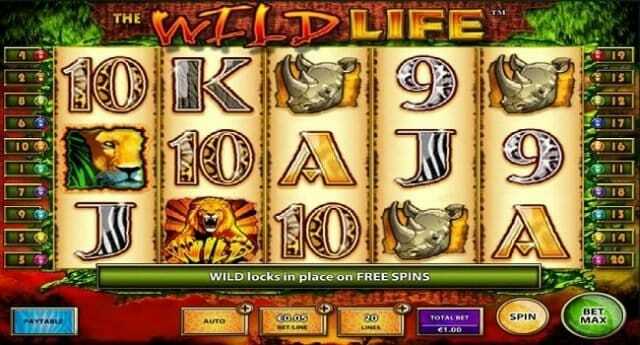 The Wild Life is 5 reels and 10 paylines slot game powered by IGT. Total number of con for the game is 10 and it can be played using any devices including desktop and mobile for 10p to £2,000 per spin. The game offers 2,500 coins on your total bet. The free spin bonus feature of this slot can give you 10 to 20 free spins. As the name suggests, the game is based on African wildlife theme and it features expanding wilds. The game includes symbols like A, K, Q and J playing cards, as well as sunset, African plains, animal skin print, elephants, zebras, giraffes, rhinos and lions. The lion is the most valuable and highest paying symbol of this game which would give you 250 times of your total stake, if you land 5 of these symbols across a payline. The roaring lion is the wild symbol in this slot and it only appears on reel 2,3 and 4. It will form a winning combination for you. The Africa scatter is the most important symbol of this game because if you hit 3 or more of these Africa scatter symbols on your screen you will trigger free spin bonus feature and will be awarded 10 free spins. The 4 scatter will give you 15 free spins and 5 scatter will offer you 20 free spins. Play this slot at any igt casino for real money.